Learn the best of the waxing world from Toko guru and Michigan Junior Olympic Coach, Nick Baic. He will demonstrate how to make your skis fast without wrecking them, and also showcase the latest and greatest wax technologies used in the Sochi Olympics! Don’t miss this free clinic. Want to see what’s new in winter clothing and active-wear this year? Look no further than the Cross Country Ski Headquarters fashion show! Crew members will model the latest and greatest wears from The North Face, Columbia, Under Armour, Patagonia, Brooks, Salomon, Woolrich, Mountain Hardwear, Swix, Rab, Craft, Bjorn Daehlie, Smartwool, Sporthill, Lucy, Kari Traa, Skhoop Skirts, and more throughout the weekend. Best part: all this clothing is up to 25% off! You will also find a fantastic selection of 2017 cross country packages, starting as low as $279 for cross country skis, boots, bindings and poles, plus binding installation, base prep, and Ski Bones. Check out what’s new in the XC ski world, like the Atomic Motion 52 Skin no-wax skis, which have a synthetic mohair grip zone for reliable and quiet no-wax performance. We specialize in cross country skis that are fitted especially for you, at the best price. See how much fun winter can be with a new cross country ski package! Shop with us on Small Business Saturday for special sales and givaways, like Buy 2 Get 1 Free Smartwool socks, plus a free pair of socks with any 2017 sweater purchase! The most important reason you should come see us on Thanksgiving Weekend is, of course, Bob’s Bean Bomb. This hot, cheesy, bacony dip has a cult-like following for good reason. It will be served all weekend. Free Nordic Walking pole demos, Fischer and Jenex V2 Roller ski demos, and C.A.T. ski demos all weekend, too! If we have received enough snow by December 1st, we will groom Rolling Hills, Trapper’s Cabin, Mackinac Cut and Wild Turkey Trails. All 18 kilometers of trail will be groomed for cross country skiing and snowshoeing by December 3rd, snow permitting! Take advantage of this great opportunity to demo some great skis that are still on sale at Pre-Season package prices! Some of the best cross country skiing in Michigan can be done at night. Experience the magic of winter at night with the help of an LED headlamp! For only $5 per night, rent a very bright LED headlamp and enjoy the trails in a new way. Please pick up headlamps during store hours – before 6pm Friday and Saturday and before 5pm Sunday through Thursday – and return them between 10AM and noon the following day. Don’t miss out on undoubtedly some of the best technique training available from Amy Powell, former MI Cup Overall Women’s Champion, Vasa 50km champion, Level 3 PSIA certified ski instructor, and all around great skier and coach. Amy is excellent at coaching a wide array of abilities, has a keen eye for form, and a lot of methods and drills to get you skiing faster and more efficiently! She will run a clinic for both classic and skate skiing at XC Ski HQ. The Level 1-2 Skate Clinic will be from 10:00am – 11:00am, and the Level 2-3 Skate Clinic will be from 11:30am – 12:30pm. The Level 1-2 Classic Clinic will be 1:30pm – 2:30pm, and the Level 2-3 Classic Clinic will be from 3:00pm – 4:00pm. The cost per clinic is $20, or two for $35. Space is limited, so sign up soon by calling 800-832-2663 or emailing info@crosscountryski.com. After the ski clinic is our annual wax clinic at 4:00pm. This year, Fast Wax founder Dan Meyer will be giving the clinic, which will be highly informative and of interest to both racers and recreational skiers. He will go over waxing technique for skating and classic, and will also highlight some key products from increasingly popular, USA-based wax company. There is no charge for this clinic. The XC SKI HQ Team dinner follows the wax clinic, beginning at 6pm. Come join the 2004, ’07, ’08, ‘09, ’10 ’13, ’14, and 2015 Michigan Cup Champions (also the ’10, ’11 and 2013 Brumbaugh Cup Champions) in our annual kick-off potluck dinner. We’ll introduce new team members, review last year’s performance, and strategize on how to bring home the MI and Brumbaugh Cups in 2016. Other topics will include technique, team training dates, and upcoming race info. Learn how to cross country ski at our Saturday free ski lesson! This beginner lesson teaches the basics of cross country skiing, including classic diagonal stride and/or skate skiing, hill climbing and descending, and turning. We even teach you how to get up after you fall down! Adults and children are welcome. If you need to rent skis for a nominal charge, please sign in at the rental desk no later than 3:45pm. This class is free and lasts approximately 1 hour. Trapper Santa on the Trails! Ski or snowshoe to Trapper’s Cabin to find Trapper Santa! This rustic, wizened Santa will be tending the bonfire, roasting chestnuts, and telling wintery tales to kids from 1 to 92. Join him for free hot cocoa and lots of Christmas spirit! On Christmas Eve, we will be open until 3:00pm. Enjoy the holidays! Cross Country Ski Headquarters Store is closed. Parking lot and trails are open during daylight hours, on the house. Kids from Roscommon, Houghton Lake, and Grayling are invited to join our 6 week 4-H cross country ski program, which meets every Tuesday from January 3rd until February 7th, 2017. This annual program teaches kids from Kindergarten though 8th grade how to cross country ski and skate ski for a nominal fee. Kids must register through the Roscommon 4H Extension Office. Program includes ski rentals and ski instruction, and parents are encouraged to ski with the kids! Parents who volunteer to ski with the kids will receive free ski rentals. “Cold is Cool”: Fourth and Fifth Graders Ski Free! Cross Country Ski Headquarters has partnered with Michigan Snowsports Industries Association (MSIA) to give Michigan kids an opportunity to get out, have fun and get healthy this winter. This statewide program provides every 4th and 5th grader the opportunity to ski for free at Cross Country Ski Headquarters and various other ski areas with a “Cold is Cool” Ski & Ride Passport. This passport gives them three facilities passes at Cross Country Ski Headquarters, plus other perks. Passports can be obtained through any Michigan school system, or online at www.goskimichigan.org. Proof of 4th or 5th grade status is required, and children must be accompanied by a paying adult. Cross Country Ski Headquarters has teamed up with Michigan’s McDonalds restaurants to offer an exciting and very affordable introduction to the sport of Cross Country Skiing in Michigan. The program is designed to introduce a healthy outdoor winter activity to anyone with an interest in outdoor winter recreation. The program includes a group lesson, ski equipment rental, and XC SKI HQ facilities pass for the day. The price for this Discover Michigan Skiing program is $20 for adults and children 6 years old and older. The lesson covers basic maneuvering on skis, including classic technique, turning, controlling speed going downhill, and getting up from a fall. At the end of the program, participants receive a $20-off coupon valid at participating Michigan Ski Industries Association ski shops. The Discover Michigan group lesson usually starts at 10am on Saturdays throughout the month of January, but if you have a group of 4 or more you may schedule a “private” group lesson most any day or time. In either case, sign in at the rental desk at least 15 minutes prior to the lesson time to get fitted for ski equipment. Please pre-register by calling 800.832.2663. Entering its 20th year, the Pure Michigan Winter Trails Day offers children and adults who are NEW to snow-shoeing and cross country skiing, the chance to try both activities for FREE. Come join us and discover how fun winter fitness can be, and enjoy the social aspects that accompany these easy-to-learn winter sports. Check-in is at 10am. Please make sure to pre-register, and remember, this program is aimed at folks who have never X-C skied or snowshoed before. Check-in is followed by free outfitting in snowshoes, boots, skis and poles. 10:30: X-C Ski & Snowshoe clinic. Learn how to get the skis and snowshoes on, how to hold the poles, and how to start cross country skiing and snowshoeing. Also learn the important skills of how to fall down and how to get up! 11:10: Go on a tour to Trappers Cabin for Hot Dogs, bonfire and Hot Cocoa, all on the house. After lunch at the Cabin, skiers and snowshoers will have the choice of exploring more trails, or being guided back to Cross Country Ski Headquarters. 3 PM (or earlier): Skiers return from their tours and return snowshoes, boots, skis & poles. They are invited to relax in front of the Fireplace in the Stone Turtle Day Lodge. We ran completely out of equipment last year, so we insist upon pre-registering! We have a limited number of skis and snowshoes. If we are fully booked we will reschedule you to a Saturday later into January. Please pre-register by emailing your name, address, age, shoe size, and choice of X-C skiing or snowshoeing to: info@crosscountryski.com or calling 800-832-2663. Grill Cook Erin Gielincki will make a special appearance on the Stone Turtle Day Lodge Sun Deck to Fire Grill your choice of Salmon Burgers, Lean Beef Burgers or Black Bean Veggie Burgers. Choose your entree and Erin will grill it to perfection. If you dare, ask that your entree be cooked “Fire on the Mountain Style” – Grilled with sizzling hot sauce and topped with Jalapenos, Lettuce, Tomato, Onion and creamy Buffalo Blue Cheese dressing. 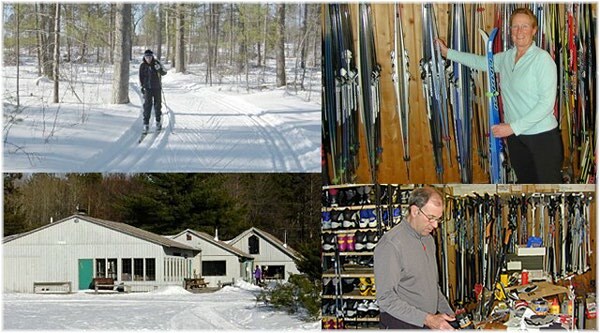 This week, Cross Country Ski Headquarters would like to treat all “seasoned” outdoors people, age 60 and older, to a complimentary XC SKI HQ Facilities Pass, plus a coffee or hot cocoa on the house. They are also urged to demo any of the latest and greatest skis, boots or snowshoes at no charge to help make their on snow experience even more fun. Join us for our very first women’s ski club at Cross Country Ski Headquarters! 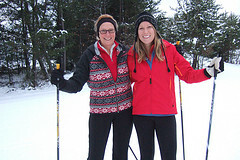 This program encourages local women to get together and cross country ski in a relaxed, welcoming environment. PSIA certified Level 3 ski instructor, Carole Mueller-Brumbaugh, will be available for instruction and technique feedback to anyone who would like some coaching. This program will have a loose format, so women may arrive any time between 5:00pm and 7:00pm to participate; however, to rent skis for a nominal fee, skiers must arrive before 5:15pm. The fee for this program is $5 per session, all of which will be donated to the River House Women’s Shelter in Grayling. Included in this fee is a facilities pass, optional ski coaching, and headlamp rental. Experience the magic of winter in a whole new light! Every full moon during the ski season, we will light the Trapper’s Cabin trail with torches, creating a truly unique and memorable nighttime experience. We will also have a bonfire and serve hot chocolate at Trapper’s Cabin from 6-8:00PM. Skiers who need to rent skis must do so before 7PM. Join us for an evening you’ll never forget! XC Ski HQ Top Chef, Erin Gielincki, will be raising the bar for comfort food at Cross Country Ski Headquarters this weekend. Using our special recipe for homemade mac ‘n cheese, we will be serving steaming bowls of this masterpiece, and skiers can choose from a variety of toppings to optimize their mac-experience for personalized enjoyment. We’re talking bacon, blue cheese, roasted broccoli, toasted sunflower seeds, plus classics like steamed peas and hot dogs (obviously). Get ready to indulge after a day on the trails with this favorite American culinary pastime! Stretch and Slide begins at 10:00am with a Hatha yoga class at the Gerrish Twp Municipal Building (1 mile south of XC Ski HQ), and continues with a full day ski/snowshoe rental, group lesson, Facilities Pass, and homemade chili lunch (classic or vegetarian) at Cross Country Ski Headquarters. Spend the afternoon enjoying the serenity of the beautiful Michigan winter forests on the pristinely groomed Headquarters ski trails, or relaxing with a mug of hot cocoa by the Stone Turtle Day Lodge fireplace! All are invited to participate, including novices to yoga, skiing or both. Over a $65 value for $45 ($35 if you have your own equipment). There will be an opportunity to change from yoga clothes into ski clothes before the ski lesson, and XC Ski Headquarters has a great selection of ski clothing if you need to get outfitted before the lesson! To pre-register (recommended but not required), email info@crosscountryski.com or call 800-832-2663. Build your own gourmet flatbread pizza and have it grilled to perfection on our wood-fired Sun Deck barbeque pit! Choose from a variety of toppings to create your own pizza masterpiece, and enjoy the satisfying flavors of delicious fire cooked crust, savory sauce, bubbling cheese and fresh toppings. Mama Mia! A favorite XC Ski HQ tradition, Paella on the Sun Deck celebrates the world-renowned and absolutely delicious rice dish that originates in Spain, and offers skiers a hearty, flavorful feast. Bob and Lynne learned the method from Paella chef master Ayo while visiting Nerja, Spain, and are excited to serve this traditional dish to hungry skiers at XC Ski HQ. Prepared in a massive cast iron pan over an outdoor fire pit, this lunch is almost as enjoyable to watch being cooked as it is to eat! Served piping hot with Saffron-spiced chicken, shrimp and vegetables, this dish will be presented in two seatings: 1:00pm and 3:00pm. Buen Provecho! Join us for a day of delicious craft beer on the ski trails! Our favorite local brewery, Paddle Hard Brewing, will bring their hops to the snow at several tasting stations along the ski trails, at which skiers and snow-shoers can try some of Michigan’s most excellent craft beer. The Beer Trail Pass includes a full day facilities pass, barbecue lunch at Trapper’s Cabin, and four beer tokens to be used at any of the stops for $35. Additional beer tokens may be purchased separately. Ski and snowshoe rentals are available for a nominal fee on a first come, first served basis, and free mini ski lessons are available upon request. Experience the magic of winter in a whole new light! To celebrate Winter Fest, we will light the Trapper’s Cabin trail with torches, creating a truly unique and memorable nighttime experience. We will also have a bonfire and serve hot chocolate at Trapper’s Cabin from 6:00-8:00PM. Skiers who need to rent skis must do so before 7PM. Join us for an evening you’ll never forget! Build your own gourmet Chili Lunch! Start with our famous Classic Chili or Veggie Chili. Then head to the Chili Bar and add such toppings as fresh jalapenos, fresh poblano peppers, white onion, red onion, sharp cheddar cheese, feta cheese, sour cream, or strange but delicious favorites like cucumber yogurt or black olives. Have your chili in a bread bowl, or help yourself to some fresh baked cornbread and real butter! You might never be the same! Join us for breakfast at the Stone Turtle Day Lodge Café, and watch the live stream of the American Birkebeiner ski marathon on the big screen! The largest cross country ski race in North America, the “Birkie” starts in Hayward, WI and spans 50km to the town of Cable, where thousands of people line the streets to watch the finish. Called “the greatest show on snow,” the race attracts over 10,000 skiers and 20,000 spectators, and is highly entertaining and inspiring to watch. A delicious breakfast menu will be available from 9:00am to 11:00am. Get your Fill at the Grill – Fire on the Mountain! Grill Cook Erin Gielincki will make a final appearance on the Stone Turtle Day Lodge Sun Deck to Fire Grill your choice of Salmon burgers, Lean Beef Burgers or Black Bean Veggie Burgers. Choose your entree and Erin will grill it to perfection. If you dare, ask that your entree be cooked “Fire on the Mountain Style” – Grilled with sizzling hot sauce and topped with Jalapenos, Lettuce, Tomato, Onion and a creamy Buffalo Blue Cheese dressing. New this year, the super fun post-relay-race party just got even more fun! After the Relays, stick around for the awards ceremony on the sun deck, featuring $1 beers from Paddle Hard Brewing! Feast on house-pulled BBQ pork sandwiches, black bean veggie burgers, vanishing scalloped potatoes, and of course our famous home-baked cookies. This post-race meal is included in the race registration fee. Each racer will also receive an official 2017 Michigan Cup Relays Pint Glass! Spring Ski Fest: Hawaiian Barbeque! Wear your Hawaiian shirt and feast on some of the best Hawaiian Barbeque this side of the Pacific! Grill chef “Hawaiian Ryan” will be barbequing locally raised pork hocks, along with island style veggies and of course fresh pineapple. Celebrate all that is great about spring: long, sunny days of great cross country skiing in Michigan! The longest standing juniors race in Michigan, the Muffin Race will be held at Cross Country Ski Headquarters on Sunday, March 19th. The race is a Junior Girls & Boys 8km Pursuit race. Skiers will classic ski the first half of the race then ski freestyle the second half of the race. Registration begins at 9am on Sunday, and we will shoot for a 10:30am start. This is a Michigan Cup Junior Race. Medals will be awarded to the top 3 finishers in the girls and boys races. Surprise Event – To Be Determined! As long as the snow lasts into spring, we will continue to have weekend events at Cross Country Ski Headquarters. We will determine the event based on the snow we have – or don’t have! 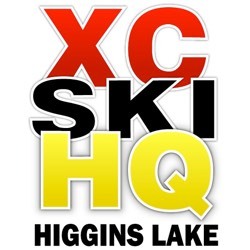 Stay tuned to find out what’s in store this weekend at the home of cross country skiing in Michigan!